There has been plenty of discussion from the federal government, especially in the lead-up to this week’s budget, about closing tax loopholes (expenditures/breaks/preferences). The 2015 Liberal election platform proposed to raise $2 billion a year by 2018 by ending “unfair tax breaks.” The government has a panel looking at which loopholes to close and a report on its progress may be included in the budget. I’ve done my own analysis (in a report called “Out of the Shadows”) of who wins in Canada’s personal tax expenditures system. No surprises here: it’s the rich. The federal government spends over $100 billion a year on personal income tax breaks alone (there are about 120 of them), so there’s some real money to be made. The trouble is that the people getting the big bucks from these loopholes—mostly Canada’s highest-income earners—tend to have good lobbyists. With that in mind, there are low-hanging fruits on the tax reform tree—expenditures we could cancel this year—that would raise $6.5 billion in new government revenue while mainly affecting a very small (and well-paid) section of the public. There is a tax break if a company pays you some cash (ie. a dividend) because you own their stock compared to say working for a living. The argument for the difference is that it avoids double-taxing corporate investors—once on corporate profit, then again on personal income (dividend) taxes. But double taxation is incredibly common: go buy gas and you were triple-taxed—once because you paid with wages that were taxed as income, twice because you paid GST/PST on the gas, and a third time through an additional a gas tax. Generally, only the richest Canadians earn enough dividend income for this tax expenditure to be helpful for them, since they’re more likely to own more stocks. 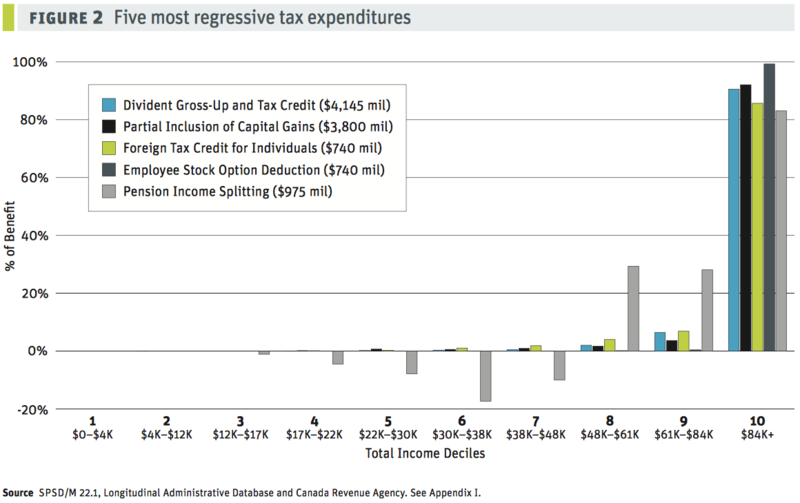 Not surprisingly, 91% of benefits from the dividend gross-up tax credit flow to the top income decile (see chart above). Unfortunately, there has been almost no pre-budget discussion about addressing this unfair loophole. How did you get paid last month? I bet it was with money. That might seem like an odd question, but the richest Canadian CEOs can also get paid in stock options. As their company stock goes up, those options become worth more. Incredibly, there is a 50% tax break if you’re paid in stock options instead of in money. In 2014, only 46,000 tax-filers (out of 26 million) applied for this tax break. Those earning incomes in the richest decile gained an incredible 99% of the benefit of this tax break. Unfortunately, the Liberal platform targeted it for closure last year but they couldn’t quite pull the trigger. Remember how family income splitting was only for rich families where one person could afford to stay home. Well, the same thing continues to be true for seniors where one person in a couple worked over their lifetime (and now receives a pension) and the other did not. The benefit of pension income splitting is also very concentrated among Canada’s richest, with just over 80% of the benefit going to the top decile of income-earners. As this is related to seniors it has some inherent political protection. But let’s be honest: $1.3 billion would go a long way to wiping out seniors’ poverty. If these three tax loopholes—pension income splitting, the employee stock option, and the dividend gross-up—were closed it would raise $6.5 billion a year for infrastructure (or whatever, really). Unfortunately, it doesn’t look to be part of the government’s plans. The Liberals do, however, appear ready to change the capital gains inclusion rate. Most people make money by working for a salary, but some people earn income through dividends (see above) or by buying and selling things. If you bought and sold a stock or a condo or a renovated house, for example, you might earn a “capital gain” (if you sold it for more than you bought it for). Only half of the profit on capital gains gets counted on your income taxes. Put another way, the speculative house-flipper will pay taxes on their gains at half the rate the contractor pays for framing in that extra room. Guess who makes the most money buying and selling stocks and real estate? Yes, again, it’s the rich. In fact, 92% of this tax break goes to the richest decile of Canadians. It wasn’t always this way. From 1990 to 2000 capital gains only enjoyed a 25% tax rebate, not the 50% rebate earned today. There is the possibility that we may go back to that previous “75% inclusion rate,” according to news reports before the budget. And that would make our tax system moderately more progressive than it is today. Have you got your own bugbear of a tax loophole? Put it into the comments below. David Macdonald is a senior economist with the Canadian Centre for Policy Alternatives, and author of Out of the Shadows: Shining a light on Canada’s unequal distribution of federal tax expenditures. Follow him on Twitter @DavidMacCdn. By far the most insane tax break which we taxpayers give every year is the $3.3 billion in subsidies to fossil fuel companies. About two thirds of this is actuall from provinces, but the feds could deduct provincial subsidies from federal transfers to reduce the amount to zero!